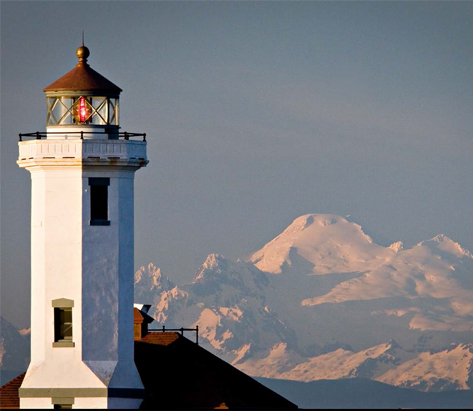 The Point Wilson Lighthouse, marking the entrance to Admiralty Inlet, was built by the Lighthouse Service. At 51 feet above the water, the lens is the highest of all the lighthouses on Puget Sound. The 1914 lighthouse replaced an earlier wooden lighthouse which was con¬structed in 1879. The Point Wilson Lighthouse, lo¬cated in Fort Worden State Park near Port Townsend, is on the National Register of Historic Places and the Washington State Heritage Register. It is one of the most important navigational aids in Washington, a link connecting Puget Sound and the Strait of Juan de Fuca.